Hugo Hirst (1863-1943), of GEC, an immigrant who fiercely defended English industry from the pressure of German industry, especially before WW1. Later became Lord Hirst of Witton. 1863 November 26th. Born in Altenstadt, Bavaria, as Hugo Hirsch; he was the son of Emanuel Hirsch, a distiller later of Munich. From 1870, he was educated in Munich, Bavaria, Germany where he studied chemistry. 1881. Aged 18 he came to London. Started work for a trading firm. Later moved to the Electrical Power Storage Co at Millwall. 1884 Joined Gustav Binswanger who had founded a firm selling electric appliances - Electric Apparatus Co.
1889 Saw the business possibilities of manufacturing electrical appliances. With capital from his friends, Max Binswanger and Gustav Binswanger, they founded GEC. 1892 He married Leontine Hirsch, daughter of Herman (Norman) Hirsch, on 30 May 1892. 1901 Living at Springmead, Windsor Terrace, Hampstead: Hugo Hirst (age 37 born Germany - naturalised British subject), Electrical Manufacturer - Employer. With his wife Leontine Hirst (age 28 born Germany - naturalised British subject) and their three children; Harold H. Hirst (age 7 born London); Muriel E. Hirst (age 6 born London); and Irene P. Hirst (age one month born London). Seven servants. 1910 Became chairman of The General Electric Company. 1911 Living at Springmead, Windsor Terrace, Hampstead: Hugo H. Hirst (age 47 born Germany - naturalised British subject), Manufacturer of Electrical Apparatus and Machinery - Employer. With his wife Leontine Hirst (age 37 born Germany - naturalised British subject 1887) and their daughter Irene P. Hirst (age 10 born Hampstead). Married 18 years with 3 children. Six servants. 1920 President of The British Electrical Development Association (BEDA). THE British electrical manufacturing industry has suffered a severe loss by the death of Lord Hirst, the chairman and managing director of the General Electric Company, Ltd., which occurred at his country home, Fox Hill, Earley, near Reading, on Friday, January 22nd, following a short illness. Lord Hirst was seventy-nine years of age, and until early in the New Year he was regularly in attendance at his office. A founder of the General Electric Company over half a century ago, he became managing director of the company in 1900, and in 1910 its chairman. He will long be remembered as a great industrialist and the controller of the world-wide organisation he laboured to create. 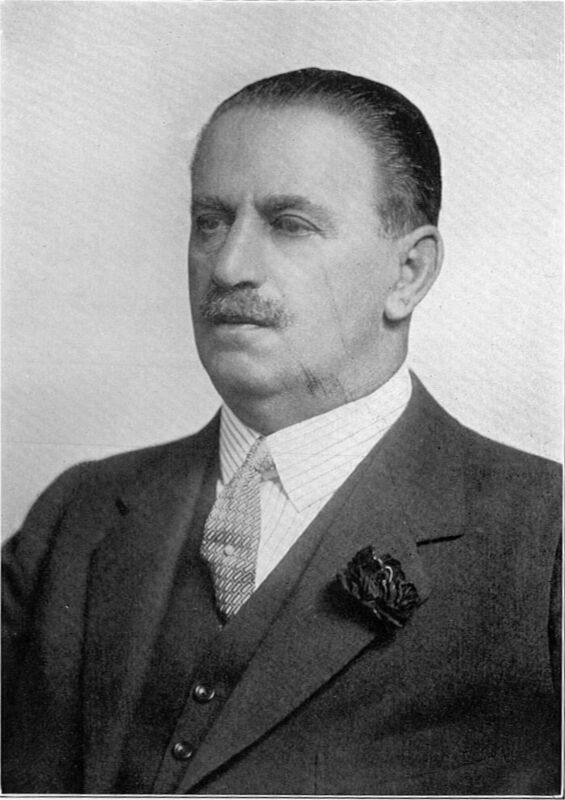 Lord Hirst was born in Munich in 1865, and was the son of Emanuel Hirsch, who was engaged in the distilling industry. Young Hugo Hirsch studied chemistry with a view to entering his father's business, but came to London at the age of sixteen and began his career in the electrical industry three years later. For some time he was with the Electric Power Storage Company, and in 1883 he took the name of Hirst. In 1886 he joined Mr. Byng in founding what he used to call "a little electrical shop," and this business formed the beginnings of the great electrical manufacturing and distributing undertaking, the General Electric Company. Early in life he planned to create a business which would make and supply everything electrical. In 1889 the company was formed, with the aid of financial friends, and from small beginnings in Queen Victoria Street it grew rapidly, always under the inspiring leadership of Hugo Hirst. No branch of electrical engineering was excluded from the scope of the General Electric Company, and before long it took an important place among the leading firms engaged in the manufacture of heavy and light electrical machinery and appliances and lamps and fittings, for which it established a world trade. At all times he was the inspirer, the dynamic force, and the pilot of his company, and he was still at its helm when he died. He was an early believer in the value of electrical research, and the company's research laboratories are among the finest of their kind in the world. Both in manufacturing and research work, Lord Hirst held strong views on the necessity of recruiting technical and business men from our public schools and universities, and to-day many such men hold positions in the company, both at home and overseas. He himself was a keen sportsman and a good athlete, especially in his younger years, and he gave every support to the social activities of his employees, providing sports grounds and clubs in London and in other large centres. Apart from his constant work for the General Electric Company, Lord Hirst did much for his country and the industry in which he was engaged by serving on many important bodies and Government Committees. He was President of the Federation of British Industries, the Institute of Fuel, the Association of Technical Institutions, the British Electrical Development Association, the Electrical Industries Benevolent Association, the British Export Society, the Incorporated Society of British Advertisers, the Decimal Association, and the Radio Manufacturers' Association. He joined the Institution of Electrical Engineers as an associate in 1888, and ten years later became a member. He was made an Honorary Member of the Institution in 1935. Lord Hirst's work for his country carried him into still wider fields, and he was looked upon as a recognised authority on industry and international trading. Among the Government bodies upon which he was called upon to serve were the Board of Trade Advisory Council, the Committee on Unemployment Insurance, the Committee on Co-operative Selling in the Coal Industry, the Committee on Industrial Research, and the Turner-Melchett Conference. He was a member of the Prime Minister's Trade and Employment Panel and was Economic Adviser to the Cabinet Research Committee. Lord Hirst represented the Government on the League of Nations Sub-Committee of Experts for Scient1fic Property. In 1898 he was invited by the Government to form one of a party of four business experts who visited Australia with the object of conferring with leaders of industry and with the Commonwealth Government on matters concerning the future development of Australia and other matters of economic interest to both countries. The report which was published by this Mission created much attention throughout the British Empire, and it encouraged the growth of overseas trade and stimulated the desire for an Imperial economic policy. He had a great interest in London and twice served as Master of the Glaziers' Company. In 1925 he was created a Baronet, and as Baron Hirst of Witton in Warwickshire, was raised to the peerage in 1934. At his country home Lord Hirst took a keen interest in scientific farming, and carried out some interesting experiments. He did much for charitable interests, both for his firm and for the industry he served. Only a few months ago he gave the sum of £20,000 to the Benevolent Fund of the Institution of Electrical Engineers, and very shortly before his death he became the Chairman of an Appeals Committee which represented all the various branches of electrical activities in their effort to raise funds for the Red Cross. Lord Hirst will long be remembered by his work in building up from a humble beginning an industrial undertaking, which to-day employs over 50,000 men and women and controls some thirty associated or subsidiary companies, and has thirty-six branches overseas, as well as thirty-seven branches in the United Kingdom. This page was last edited on 8 May 2017, at 14:54.